The following is an edited transcript of the memories of Balboa Union Church minister Clarence C. Payne as interviewed by Sharon Parris-Chambers on August 18, 2010. Sharon conducted the interview via Skype from Jamaica while Rev. Payne was visiting in Panama at Sue Robbins’s house. The transcript is a compilation of Sharon’s notes and Sue Robbins’ notes. Clarence began by giving a short history of the Union Churches of the Canal Zone. REV. PAYNE: The Canal was built by the US from 1904 to 1914. During that early period, many of the American workers came from the American South. They were mostly white and mostly Protestant. There was a desire, a need to continue spiritual life; so here in the Canal Zone, they ran Sunday schools in the YMCAs and other informal recreational buildings such as the clubhouses. In the early years, the Panama Canal Company provided chaplains to conduct services in these places for the workforce. As time went on, as more workers began to bring in their families and permanent communities were created, they perceived the need to have their own churches. Towards that end, they did some intelligent thinking: Let’s not replicate what we have in the US with various denominations of churches at four corners of an intersection. Let’s combine the denominations into a union church. The Episcopal church couldn’t support that, and they established their own churches. The Baptists did the same. But among other denominations, there was an effort to establish interdenominational churches, union churches. The National Council of Churches took this on, and inside their offices at 475 Riverside Drive in New York City they opened an office of Union Churches in the National Council of Churches. The National Council of Churches had no authority over the Union Churches, but they offered support, in any case. So the Union Churches of the Canal Zone came to be, prior to the opening of the Canal. There is a tremendous history book on the Union Churches, called Christian Cooperation at the Crossroads of the World by Rolofson that goes up through the 1940s. We called it “The Red Book.” It was an excellent book, and I have an extra copy that I would be glad to donate to the church. Rev. Clarence McConkey wrote a sequel that brought the history up to the 1980’s. In any case, the union church movement caught fire. There were between seven and nine union churches in the Canal, each with its own building. Balboa Union Church, Gamboa, Pedro Miguel, Gatun, Margarita, Cristobal (a beautiful stone building) and one on the West Bank, whose name I don’t remember. Every one of them brought pastors down from the States. They chose a joint mission statement, and they called themselves the overarching title, “Union Church of the Canal Zone.” As far as I know, this is still the legal entity with Gamboa and Balboa still yoked. I believe there were only two churches in the world incorporated by an Act of the US Congress; I don’t remember what the other was, but one of them is the Balboa Union Church. SHARON: Why did the US Congress do that? Do you have the sense that they were trying to push a certain doctrinal theology into the Canal Zone and Panama? REV. PAYNE: I don’t know. Except, of course, that the Canal Zone was a territory by treaty of the United States Government. Certainly, in the early 1900s the US was a Protestant, Christian country. Protestantism ruled. There were Catholic immigrants, but the dominant religious movement was Protestant. SHARON: Were the Union churches inter-dependent, or were they operated separately? REV PAYNE: Yes, they were interdependent, and then later they became completely independent from one another. Meanwhile, during this period, the Canal Zone, churches thrived. They were very active centers of religious and community life. I might add that in those early days, community life was centered around the churches and the Masonic movement. Most parishioners were also Masons. The Masonic lodges held dances with gloves and hats. People were making good money, and the working conditions were pleasant; so they had time and money on their hands. Masonry thrived because it is essentially a Protestant organization. This is an aside, but in those early days, I am told the Masons and the Protestants would look after one another. If there were two people that were equally qualified, they hired the Protestant or the Mason. I, of course, arrived in Panama and became a Mason. SHARON: What brought you to Panama? REV. PAYNE: I graduated from Princeton in 1962 with two masters. I married a beautiful Colombian woman (Rosita). After graduation, I looked for a church overseas, somewhere we had not been before. Since Rosita was born and schooled in Colombia, the Latin American region was a favorable area to look. I had also hoped to learn a little Spanish. We were called to Gatun, where we helped to renovate the church. We had a baby, Anita; and it was a small community of 300 people. I think we brought in air-conditioning. We had a great experience there. It was a radical shock to me, as I had always been in big churches in the inner city. This was small-town living with all its intimacies and issues. I came in ’62, and on this side in ‘63 the Balboa Union Church called Dr. Frank Tobey, Jr. He had been chief of chaplains for the Army. He was probably a two-star general. And he liked being overseas, so he accepted the job — and that did not work at all. He was The General and used to giving orders. Ministers are supposed to accept orders. He was a real shock for the congregation, and they were a shock for him. I might interject another thought: as we all know the, Canal Zone was not democratic. The Governor and staff made all the rules and called the plays. People did feel inhibited and repressed, because they always had to accept the dictates from “on high.” But in the churches and the Masonic lodges, they could take the opportunity to express themselves. As officers of the church council, they could voice their views and express their votes in ways they could not in their workaday world. So as a minister, you had to be very nimble on your feet. The officers of the church were often very strong, as church work was the one place where they could exercise authority. Frank Tobey did not get along well with this group; he lasted one year. I was 28, and I had served the Gatun Church for two years, and they said well, that young guy over in Gatun, he’s got promise. They came over and Margaret Murphy Hughes had a very significant role in hiring me. She lost a daughter — her only child — in an early age, and the Balboa Union Church library is dedicated to her daughter. Speaking of monuments, at the bottom of the hill here on the church lawn, right down by the corner, there is a monument to a milkman, who was driving down that hill one day and the brakes failed on his truck. He purposely pulled the truck over and was killed to avoid missing children; and they put up that monument in his memory. So when the time came to construct the building of this church they initially built one floor, because they couldn’t afford the second floor. The initial one-storey building was open all the way from the front door to the kitchen. None of the present rooms were there. It was open from the front to the back, and they would just form circles for Sunday school. For the building of the second floor, the Rockefellers gave a large sum of money through the National Council of Churches. So I was called to the Balboa Union Church in 1964, David was born in the first year I served. This truly was the “Hay Day” of the church. We had two ministers. We bought the building across the street. We had Sunday School classes in all four apartments and in the basement, a thriving Sunday school program. The basement was lined with classrooms. It was all air-conditioned; very comfortable spaces. The first thing I did when I arrived, because the people were eager for it, was we renovated the church. It had been very stark and bare. To give you some idea, the church was built in the era before public address systems. The pastor would stand at the front of the church, far away from the people, at a huge podium made of dark, heavy wood. This pulpit was a massive piece of furniture that was on four rollers and sat quite high. When it came time for the minister to give his sermon, four ushers would come forward in suits and ties with great decorum, and they would push the pulpit towards the pews to get the minister close enough to the people to be heard (like Caesar on a bark.) There may still be pictures of that. Anyway, that was the first thing to go when I got there. That red curtain at the front, I worked with Mr. Weed to put up that red tapestry that is in the front, and I personally designed and ordered the baptismal font and the communion table and the several stands and the two podiums. I also brought in air-conditioning. These changes were all greeted with a lot of enthusiasm, and attendance doubled in those years — probably because of the air-conditioning! Those were exciting days. We had a very active scouting program, mission program, and youth program. We had a big choir, and two services. It was a wonderful time in the life of the church. Membership was 600 and attendance was 300 in the two services. I never liked the name because “union” can make it so many things, but we were successful in drawing a number of people from Panama. The Fords, the Canavaggios, a number of bankers, people from the embassy. During those years, it was the Civil Rights Movement in the US, and Martin Luther King said that “11 o’clock on Sunday is the most segregated hour in America.” Of interest to you, of course, during my tenure of five or five and a half years we welcomed a fine couple with two children with the Embassy, and they joined the church, and he sang in the choir. It was 1968, and this was the first black family at BUC. We were bringing in new members every month. As I recall, I didn’t take new members through the Council; I just presented them. There was no question about bringing people in. Another new member was Ambassador Huang, who was a very prominent person in Panama. He was among the group that freed Generalissimo Shang Hai Shek from captors. He was the senior member of the Taiwan ambassador corps, and I helped him write his memoirs. He opened his house to the church, and we enjoyed a wonderful friendship. Other people that stood out: Bob Worsley came down during the construction era. Indeed when President Jimmy Carter came to see the Canal after the signing of the Treaty, several people were presented to him, including Bob Worsley. He always told stories from the Construction Era. Bob Worsley came as a paymaster for the Canal and would talk about walking from Chorrera for the dances at the Tivoli Hotel. his house and killed his wife. There was Rev. Bill Bibi, pastor of the First Baptist Church, and there was Bishop Goodin of the Episcopal Cathedral. The Episcopal hierarchy was pretty much kept in white hands, especially in the Canal Zone. The Episcopal churches of Panama and the Canal Zone were all integrated under one umbrella, and Bishop Goodin presided over the Episcopal churches of Panama and the Canal Zone. When he left, the position went to a Panamanian of color, and that was quite a big move which caused great rejoicing by people in Panama. I might add that Tom Ford’s cousin was an Episcopalian priest who wanted to be bishop, and he was white, and when it was given to a Panamanian, he quit the church and went into business. There were Americans who had established businesses in Panama but who had started with the Canal. Mary Carter’s husband was one. Mary was the mother of Lalu Carter and Mary Giraldez. I have a hunch that her father worked on the locks but saw business opportunities too good to pass up. We served the church from ’64 to ’69, when I had the desire to get a PhD. I wanted a new challenge. It was very hard to say good-bye. The church was very good to us. The reception for our leaving happened to be the night the first American walked on the moon. July 20, 1969. Clarence McConkey came with four children, and the church thrived, until the Americans began to leave. SHARON: How did you find the integration into Panamanian Society? REV. PAYNE: You didn’t have to integrate into Panama Society because the Canal Zone was a society unto itself. There was that portion of society who actually would brag about not going into Panama and who didn’t learn Spanish, and so that is kind of the stereotype of the society. There were two faces to the Canal Zone society. They were a minority, and some built businesses. There were people who were eager to learn Spanish. We didn’t integrate into Panama Society. We integrated into Canal Zone society, through the American Society in Panama and the Navy League. And Rosita and I actually regret that we didn’t live in Panama. Rosita was very active with the Soroptomists. In Missions, the church supported Glen Fronte and his work in the Darien. We also supported the missionary pilots and the Salvation Army in Panama. Bob Morrison was in charge of the YMCA, and we had significant involvement with that organization, too. the Morrisons. One of the interesting stories: for the Atlantic Side Union Churches, they had a special interest in the Kuna Indians from the San Blas Islands. As a group of churches, we sent the chieftain to a Bible school in the States. He eventually became Mavel Iglesia’s husband. She wrote books about the culture. We supported them. The Union churches built them a home, and the home is where you turn off the Transisthmian on the road to Porto Bello. There’s a beautiful stone and brick house on the left side of the road that was built especially for the Iglesia family. The Union churches were mission-oriented. We were very close with and supportive of Missionaries who came to Panama. There were two Methodist groups: the American group was led by Millie and Walter Reitz, and they were prosthelytizing as Methodist missionaries building schools in Panama. IPA, IFARU, others. The British group was led by Charles Butler. One church was right down on the water near the old Union Club. We would also go to worship services in Panama. We had an association of pastors for the Atlantic Side and Pacific Side on both sides of the Isthmus. I was the president of that. A British Methodist, Rev. Vick Watson came in the ‘60s to Colon, which was a difficult place. He built a school, and we supported that and were part of that. So there was an integration, and one cannot say that the Union churches turned their backs on the mission opportunities in Panama. David and Joyce Woolsey came, too, and served churches in Panama and adopted a Kuna Indian into their family. 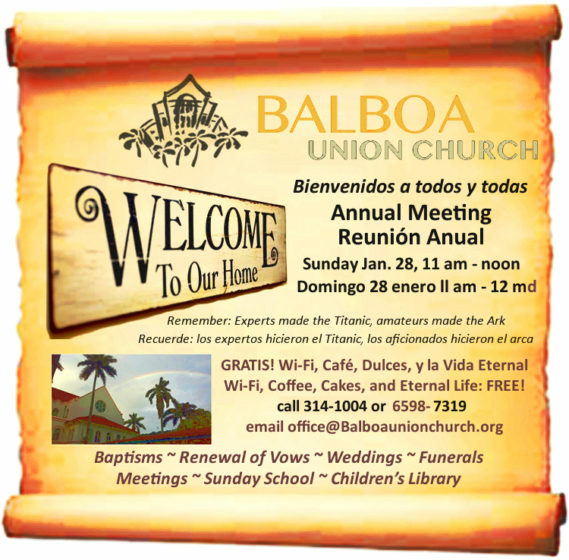 Panamanians were most welcome at the Balboa Union Church. But it was an English-speaking church. Rosita was a great help on this. That was a new move for this church, to have a pastor with a Latina wife. Until us, the pastor’s wife and family were lily white. In terms of missions, like the British empire around the world, there was probably a sense, “We are the well-to-do and we want to help the needy,” with maybe some elitism and superiority. I know we were sensitive to helping Panama, and we did not turn our backs on the Missionaries. SHARON: You had raised an interesting point that the Methodist missionaries, Walter and Millie Reitz, built schools as a means of proselytizing. Could you expand on that? REV. PAYNE: It is my understanding that at some point all the missions societies in the various denominations in the US — the Baptists, the Lutherans, the Presbyterians, the Methodists — divided up the world so they would not compete with each other. “Presbyterians, you take your missionary work to Colombia and Costa Rica. Methodists, you take your mission work to Panama.” The effect was that there were no Presbyterian missionaries in Panama, and there were no Methodist missionaries in Colombia. It was a “comity” arrangement by the mission boards. And other countries, as well. 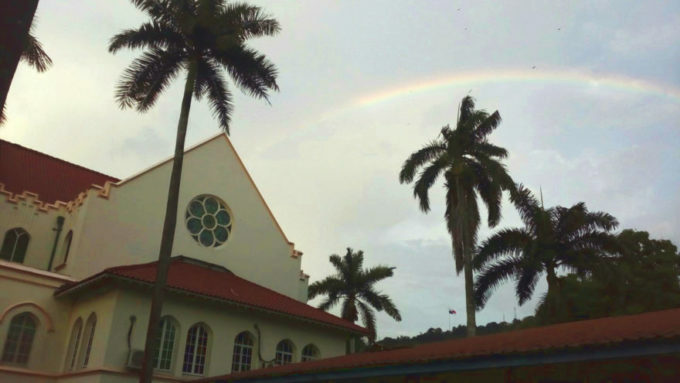 When you think about it, there is not a word about Presbyterian mission work in Panama — and vice versa in Colombia. (Obviously, there are some that never cooperated because the Baptists are everywhere.) But decisions were made in these Catholic countries — especially in Colombia — that the way to “get in” was to build schools. I can speak more about Colombia because I know it well. The Presbyterians built the finest schools there. They were private school, they weren’t missionary schools for the poor. They wanted to reach the middle class and the upper middle class, and Rosita went to these schools all her life. They’re all over Colombia, in all the cities, and they thrived; and Chapel was required every day. Back in that day, Jewish people –- Rosita and her class, I’m an adopted member of her class — there were the public schools with poor education, private Catholic schools, Colegio Americano de Barranquilla. Jewish people didn’t want to send their kids to public schools, and they didn’t yet have schools of their own that they could attend. They wouldn’t send their kids to the Catholic schools –- “You killed Jesus” –- so they attended the Presbyterian schools. They attended Chapel every morning, but I would not say that they were proselytized. These schools were not built on the notion of “Accept Jesus and be saved.” Instead, they taught the golden rule and “Jesus loves you.” They taught Christians morals and values. And everybody had to go to that chapel. Catholic families would send them for the English, and the Jewish students were there because there weren’t any Jewish schools –- with the result that Protestants were the minority in Rosita’s class; Jews and Catholics were the most. There were Bible classes every day. As an aside, we still get together for annual reunions, and we go down to the same chapel where they would go, and these are elderly Jews and Catholics sing with great enthusiasm “Onward Christian Soldiers.” I tried, but I couldn’t get them to give up those old songs. They insist; they are the songs of their youth. And that’s about all I can tell you. SHARON: Thank you, Rev. Payne, for your time and insight.